Maybe it's because of all of the vampire hype due to Twilight, True Blood, and The Vampire Diaries, but I decided to catch up on one of the most famous teeny-bopper/brooding vampire franchise, Buffy the Vampire Slayer. 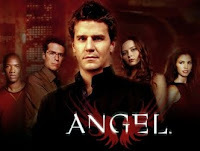 I liked the first couple of seasons of Buffy, but I really liked David Boreanaz's Angel character, so naturally I had to check out his spin-off series, and to be honest, I enjoy Angel way more than Buffy. Sure, my favoritism has something to do with my man-crush on Boreanaz, but I do find Angel's character way more compelling than Buffy. The whole brooding, vampire with a soul shtick really works, especially when he takes a more devious turn. Plus, Boreanaz plays the tortured, noble bloodsucker way better than Patts and Moyer. Also, the show works because of its darker tone. Buffy had its dark moments, but at the end of the day it was still a teen-oriented show while Angel ranks up there with some of the best noir and pulp films/shows out there. While Angel is pretty morose show, it still has some wonderfully black comedic moments, which beats out Buffy's Valley girl-isms. I love Angel more than any other Joss Whedon show, but let me just warn you: You will either love/hate what is to come in seasons 3 and 4 especially. I know many fans who stopped watching after a couple of the weird turns the show took. I'm looking forward to your thoughts and reaction after you see where it goes. Thanks for the head's up. Season 2 was so brilliant, that it's hard to imagine anyone not loving the show. Then again, most people hate it when their shows change. I'll let you know what I think. I finally finished up Angel, and while I loved the series overall, I have to agree that season 4 was just odd, and season 5 almost got things back on track but just fell short. Still a pretty great show though.